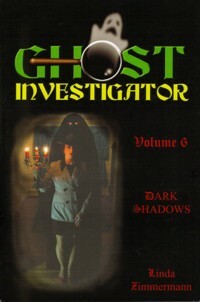 Ghost Investigator Volume 6: Dark Shadows Ghost Investigator Linda Zimmermann encounters dark, menacing apparitions across New York State in the sixth volume of her true ghost stories. Included in this book is the infamous Rolling Hills Asylum in Bethany, one of the oldest Masonic lodges in McGarrah's Inn in Monroe, and the Gomez Mill House in Marlboro, which is the oldest surviving Jewish home in America. 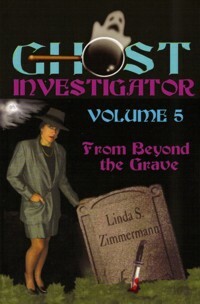 There are many photos, including one Zimmermann considers to be the best "ghost photo" she's ever taken. All new stories, including: Murder victim's dying breath Body buried in the basement? Desperate cry for help Screams in the night A violent spirit tries to harm the living. All new stories, including: Ghosts of a double hatchet murder Historic haunts Ghost magnets Civil War spirits The Road of Death. 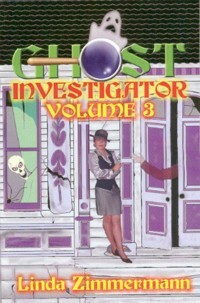 There is also a special frightening update on the "Grandma's House" investigations featured in Volume 3. 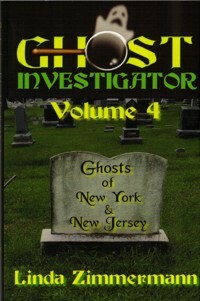 New true stories from the Ghost Investigator Linda Zimmermann From New York’s Hudson Valley: A Ghost’s Grave is Found in Chester Smalley Inn has Eternal Guests in Carmel A Dark Shadow Moves in Edenville A Lonely Spirit Seeks Out Children in Westtown A Mental Hospital has Phantom Patients A Mysterious Man at Grandma’s in Port Jervis Warnings of Fire in Port Jervis Cemetery Gates Beckon in Wappingers Falls In Connecticut: Former Owners Keep Watch Over Homespun Farm in Griswold.